The South African Research Association for Early Childhood Education (SARAECE) hosted its third national conference in May 2018. The conference provides an academic forum for the development and dissemination of research and involves Higher Education Institutions (HEIs), NGOs and other interested stakeholders. The theme of the conference was ‘Transforming teacher education in the early years’. 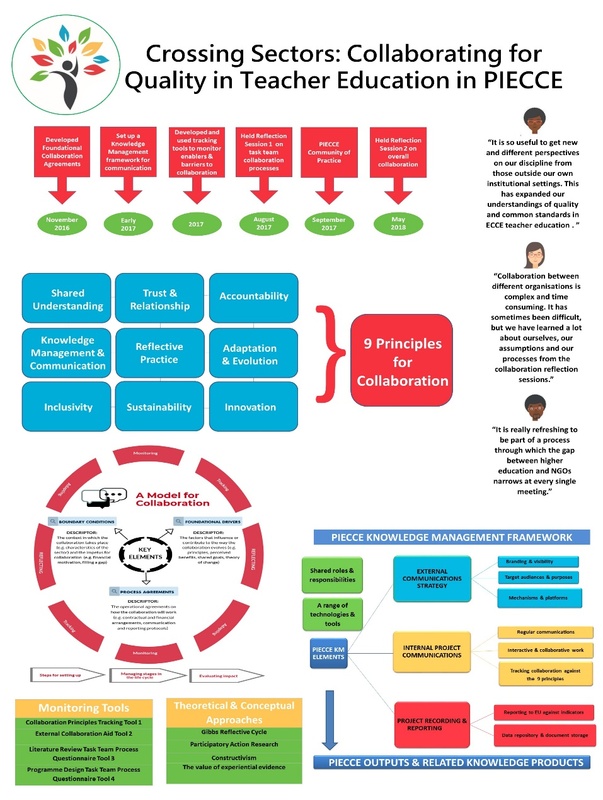 In line with this theme, BRIDGE presented a poster on how collaboration processes between HEIs, NGOs and TVETs are evolving in the Project for Inclusive Early Childhood Care and Education (PIECCE). One of the three key outputs of PIECCE is to develop a collaboration process model for programme development, which is being led by BRIDGE. A ‘collaboration-in-action’ approach to developing the model is taken throughout the project, using an iterative and self-reflective process in structured reflection workshops and interviews, and monitoring processes and perspectives with online collaboration tracking tools. Lessons on enablers and barriers, and ways in which internal and external pressures impact on collaboration have been captured. There have been interesting reflections by consortium members on how working outside their usual institutional boundaries, and sharing information and different contextual perspectives, has enriched curriculum perspectives. Stay tuned for further updates on PIECCE as we move into the next phase of materials development. For more information and to access the PIECCE knowledge products produced thus far, visit www.piecce.co.za.